I waited for several days before sitting down to recap Doubt in my mind. So first things first – the central part for me was the performance of Meryl Streep. As an actress, she is definitely in a class of her own, a living classic. So yeah, her talent is undoubted, and could be taken for granted, to some degree. Not her personality though. Not Meryl Streep the human being. Because it’s exactly this part of her that brings uniqueness to her roles – her humanity. I do have a crush on Meryl Streep, in a way that I wish she was my favourite aunt. I would spend days on end with her. Otherwise, it’s a movie about the very current pedophilia-in-priests issue – but not really. 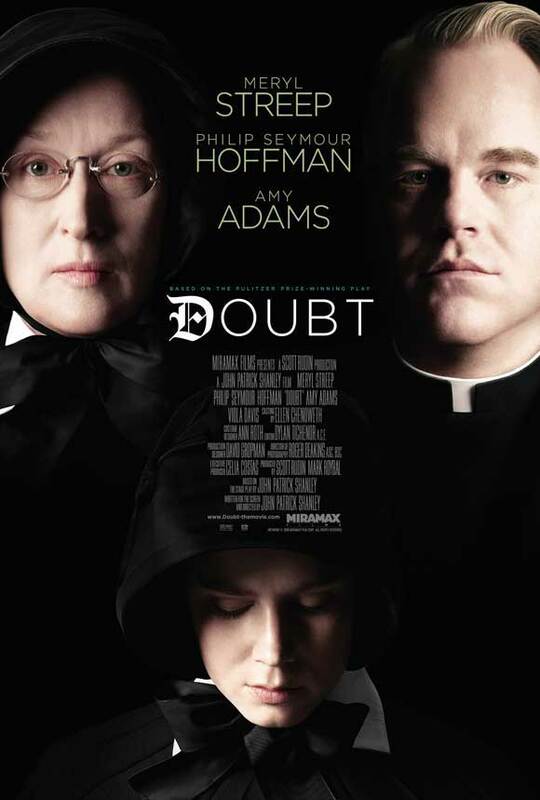 Instead of going documentary or didactic on the subject, the script rather focuses on exploring the shades of doubt within a set of characters – Aloysius, James, Father Flynn (Phillip Seymour Hoffman in yet another near-perfect role), and an African-American mother (Viola Davis, with a very understated, but powerful performance). Doubt is a very universal, and then a very personal thing, and all we know is that we can never know. One of the flaws of the movie is that it in a way nudges us in one of the possible directions, suggesting a truth to be discovered – while there is the sense that keeping viewers on the very edge till the very end could have given the film even more weight. Anyway, it’s worth watching even only because of the two confrontation scenes involving Streep – vs. Hoffman and vs. Davis.